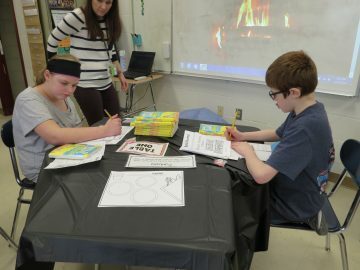 PHMS Sixth and Seventh-grade students in Mrs. Janov’s small-group reading instruction class enjoyed a special afternoon at their first “Book Tasting.” Mrs. Janov organized the event and secured VIP reservations for her students at the Reading Café. Dining tables were set up with menus, place mats, and books. Each student had the opportunity to dine at each table and sample a variety of books. After checking out the front and back covers and inside flaps of each book, students spent a few minutes browsing through them to develop their first impressions. Students filled out their “menu” by writing their observations and providing an overall spoon rating of the book. They discussed at their table if they would order more of the book or take home leftovers. The feedback gathered at the book-tasting event would determine which book the group would read next. The Book Tasting event was a huge success and a great way for students to sample different authors, genres, and series and expand their reading palates. Book donations were generously provided by the Atlantic Coast Conference of NC, Kimberly Beatty, and Mrs. Janov through DonorsChoose.org. Thank you to all of the donors and to Mrs. Janov for providing this fun and creative lesson to inspire middle-school readers! If you're looking for a particular county, city or school district, try Find My School.